Posted on February 17, 2018 by Jessica T.
All of my previous book reviews have suggested and encouraged readers to check out that specific novel, for it appealed to me; however, this time around, while I still recommend my audience to read 1984 by George Orwell, I cannot say I enjoyed reading it. Dystopian novels have never interested me, nor have they ever made me feel good after reading. A sense of uneasiness settles in my gut as I begin to think about the messages the author is voicing about our societies and worlds. 1984 is a dystopian novel, foreshadowing the downfall of our society if we allow political authority and sovereignty to fall into the wrong hands. Orwell, motivated to write after witnessing the horrors of Hitler and Stalin, demonstrates that dictators and despots threaten to plague our governments and therefore, our societies as a whole. In the superstate Oceania, citizens are constantly supervised by the overruling government named the Party. The face of the Party is Big Brother, a man alluding to Stalin and his dictatorship. The Party hides behind totalitarian fear tactics: installing telescreens in every home and microphones in every corner, threatening to “vaporize” those disobedient citizens who turn against the ultimately powerful Party, brainwashing children into Junior Spies who ruthlessly turn in their rebellious parents and fixedly revering Big Brother. History, language, culture and lifestyle are all dictated by the Party. Laws ban politically rebellious words and replace them with the common language, Newspeak, which aims to suppress individualistic thinking and expression. The manipulation of history and human existence serve to fulfill governmental prophecies and create the illusion that the government is omniscient. The Party enforces acceptance and belief in hypocritical statements; this concept is called doublethink. Civilization’s purpose remains to serve the Party by obeying all laws, submitting to Big Brother as a faithful member and believing all slogans of the Party, no matter how contradictory they appear to be. Winston Smith is portrayed as an average Party member on the surface but his ability to individually wonder and question the Party’s motives lead to conflict. He realizes he is not alone in his silent fight against the Party when he meets seemingly allies. The mysteries behind many concepts and characters illustrate the theme of appearance versus reality. I will admit this novel is full of plot twists, loss and betrayal, making for an interesting read. However, I will say that the ending disappointed me greatly. Nonetheless, Orwell presents important ideas about our future as a society using allusion and foreshadowing channeled through various characters. As 1984 in my opinion is an important read but not a captivating novel, I rate it a 3/10. 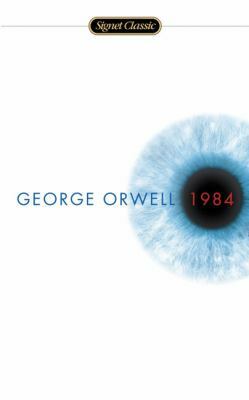 George Orwell’s 1984 is available for checkout from the Mission Viejo Library. It is also available for download from Overdrive.